HONG KONG, Sept 24, 2011 (AFP) - Apple threw open the doors to its first store in Hong Kong Saturday, its latest push to tap the booming China market, as shoppers were greeted with boisterous chanting and high-fives from staff. 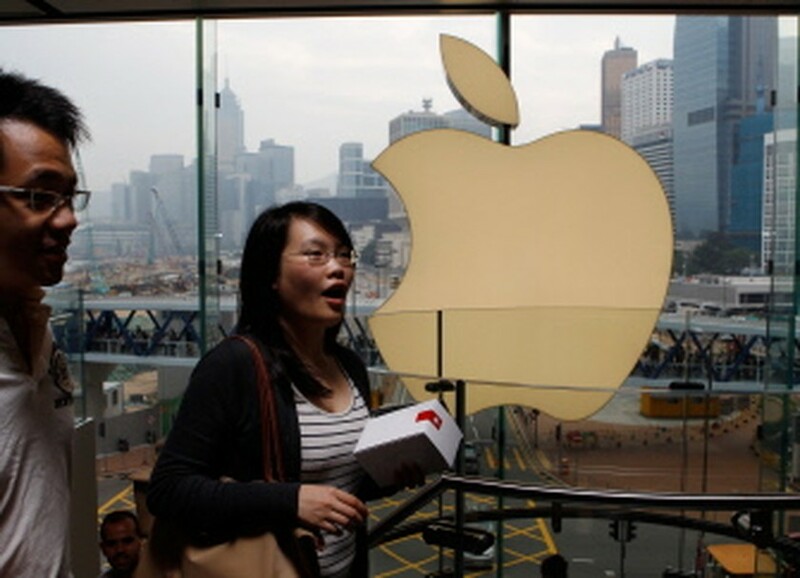 AFP- People attend the opening of the first Apple retail store in Hong Kong on September 24, 2011. The minimalist store spread over two floors in one of Hong Kong's most upmarket shopping malls is Apple's sixth outlet in China, launching just a day after the doors opened on another new branch in Shanghai. Apple's second quarter revenue in greater China -- which includes Hong Kong and Taiwan -- reached $3.8 billion, a six-fold rise on the same period a year earlier, making the region a key driver of the company's record results. Die-hard fans in China, which has the world's largest online population with 485 million users, have been known to line up for days to get their hands on the latest Apple products. A queue of more than a thousand people snaked along an overpass near Hong Kong's Victoria Harbour, with some people waiting from Friday afternoon to be among the first inside on Saturday. Employees handing out free t-shirts chanted "Apple, Apple" and high-fived shoppers as they made their way up a spiral staircase set against a window showcasing the city's skyline. "We've waited a long time for Apple to come to Hong Kong," postal worker Tony Cho, 24, told AFP as he checked out a sleek MacBook Air laptop. "It's a very exciting atmosphere." Previously, Apple products were available in Hong Kong through registered dealers and online, but the opening Saturday marked the first branded Apple store in the southern Chinese territory. Trish Peck was among those who waited eagerly to take a peek at the shopping-mad city's newest retail phenomenon. "Hong Kong really knows how to tap the consumer slant," she said. "We haven't quite hit the China consumer level yet. For us, it's about education (for the kids)... but there is a certain cachet with the brand." China's craze for all things Apple has led to widespread cloning of iPhones and iPads, and in July an American blogger uncovered fake Apple stores in the southwestern city of Kunming. The shop was so convincing even the staff -- who wore Apple's trademark blue T-shirts with name badges around their necks -- thought they worked for the company. Two other rip-off Apple shops were nearby, one of them sporting a sign reading "Apple Stoer".